The townland of Rathpoleen is situated in the civil parish of Erke in the barony of Galmoy, County Kilkenny. The historic Roman Catholic parish to which the townland belonged seems to have been Johnstown in the diocese of Ossory, though it bordered closely on the parish of Galmoy in the same diocese. Johnstown and about two miles to the north of the town of Urlingford. The boundaries of the townland at its northernwestern corner comprise two roads which meet at a point forming the village of Crosspatrick. A number of buildings in the village are shown on the Ordnance Survey maps of 1837-42 and 1888-1913. The latter marks the Roman Catholic Chapel of St. Michael as well as a school and post office. The older map, while noting the site of St. Michael’s as a Roman Catholic Chapel, also marks another building as the ‘Old R.C. Chapel’. Other features of note on the landscape discernible on the 1888-1913 map include two quarries with adjacent lime kilns and a further lime kiln closeby, all within the townland area. Griffith’s Primary Valuation of Ireland was a survey of land and property holding undertaken throughout Ireland in the mid 19th Century and completed in the case of County Kilkenny in the years 1849-50. It provides information on landholding in Rathpoleen at that time. The total area of the townland was then measured at 269 acres. 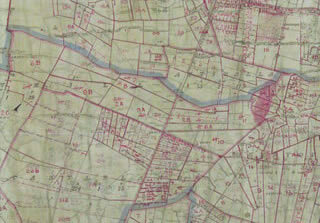 Twenty separate lots in Rathpoleen were described in the survey, some comprising land alone, others including houses (in some cases several) and/or offices (out-buildings). One lot accounted for more than half of the total townland area, and the bulk of that lot was held by one occupier. The remaining individual lots were generally of quite modest size. Some occupiers in these lots held houses alone. Some lots, not including houses, were evidently held by non-residents. Remarkably some twenty-one different surnames were represented among the listed holders. The presence of the village of Crosspatrick no doubt explains these features some of which would be otherwise a little unusual in a rural townland of relatively small area. By the time of the 1901 Census of Ireland just ten surnames were recorded among the then residents of Rathpoleen and just five of those surnames had been among the holder names recorded in Griffith’s Primary Valuation some fifty years before that. The total population was forty-eight. You can view links to the individual household census forms by clicking here. Of the surnames represented among the apparent resident holders in Rathpoleen in 1849-50 (those occupying houses rather than land alone), ten of those surnames were no longer present by 1901. This could have been due to any number of factors, including for example a change in the pattern of development of the village of Crosspatrick, which could have moved more of the residents over the townland boundary. A change in employment opportunities in the townland or surrounding area in the intervening years is another possibility, quarrying being a potential candidate in that regard. 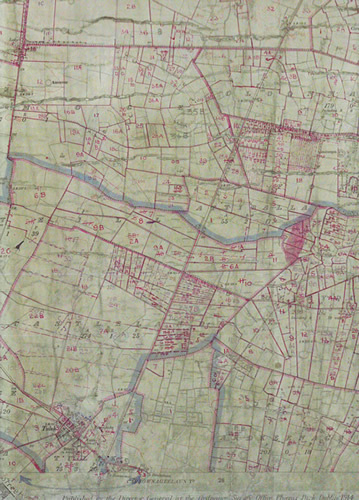 Although Griffith’s survey did not refer to any quarries or lime kilns in Rathpoleen, the earlier Ordnance Survey map (from the pre-Griffith’s era) seemed to mark such features graphically at some of the sites specifically labelled in the later version map. By the time of the 1901 census, among the adult and late teen males listed in Rathpoleen just two had occupations not specifically described as entirely agricultural. One man was recorded as a ‘Labourer’ but could have been working on a farm. The other was a ‘Mason’ who was very likely working at the local quarry. Perhaps the quarry had provided more employment in earlier years. The timing of Griffith’s Primary Valuation is another possible explanatory factor with regard to the ‘loss’ of surname representation in Rathpoleen by 1901. The survey of County Kilkenny was completed towards the end of the Great Famine. It is apparent that the area around Rathpoleen was impacted significantly be the effects of that disaster. Comparative population data from the 1841 and 1851 census of Ireland shows that, in the wider ‘District Electoral Division’ of Johnstown - which included Rathpoleen and some thirteen neighbouring townlands - the loss of population between the two censuses was in the order of 30%, almost 1 in 3 of the population. Migration, in addition to mortality, is likely to have been a major cause of this loss of population to 1851. That population decline seems to have continued right through to 1901. A decline for example of 16% seems to have occurred between the censuses of 1881 and 1901. Details of occupation/profession of the adult female residents of Rathpoleen in 1901 were unfortunately neglected in many cases. Those ladies who did provided such information generally described their occupations by reference to farming or work within the home. One lady was recorded as a Teacher in a National School. Interestingly from the perspective of today’s Ireland, where the Irish language is a compulsory subject in national/primary schools, the Rathpoleen teacher did not have any proficiency in the Irish language. In fact just two residents of the townland indicated that they could speak the language and both were from the same family. Indeed this was the family of the resident Mason, who may have travelled to Rathpoleen from another area of County Kilkenny seeking employment (he was described as a County Kilkenny native). It seems that the Irish language had been largely lost in the wider area of the District Electoral Division of Johnstown by this time. Of the 878 recorded residents in the District Electoral Division - per the National Archives of Ireland’s database of the census - just seventeen indicated a proficiency in the Irish language (being less than 2% of the total population) and even among those seventeen Irish-speakers the majority were not natives of the area, rather hailing in the main from Connaught and South Munster (where the language was more widely spoken at the time). All of the children between the ages of five and twelve years living in Rathpoleen in 1901 were described as ‘scholars’ indicating that they were attending school. One girl of thirteen years was working as a domestic servant, but had evidently attended school previously as she could both read and write, as indeed could all of the teenagers in the townland. However several of the older adult residents and some of more ‘middle’ age could neither read nor write, a common generational divide of the time. Records of individual histories of the different families of Rathpoleen through the decades should be available through various sources including civil vital records and Church registers. The registers of the local Roman Catholic parish in Johnstown for example begin as early as 1814. To discuss the history of your ancestors please feel free to get in touch - just click here.